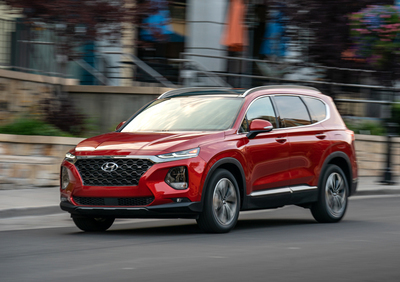 You'll need a new scorecard to keep track of the Hyundai Santa Fe's starting lineup for 2019. 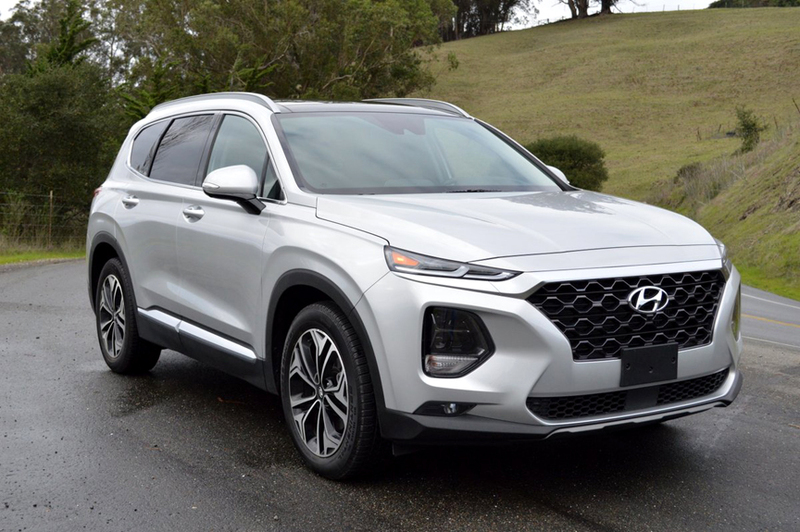 Previously divided into two basic models (5 passenger Sport and 7 passenger Santa Fe), the latest Santa Fe line is divided into two models: the 5 passenger Santa Fe (which replaces the Sport), and the 7 passenger Santa Fe XL (replacing the former standard Santa Fe). And if that's not confusing enough, you can now choose from among 7 versions of the 5 passenger Santa Fe. 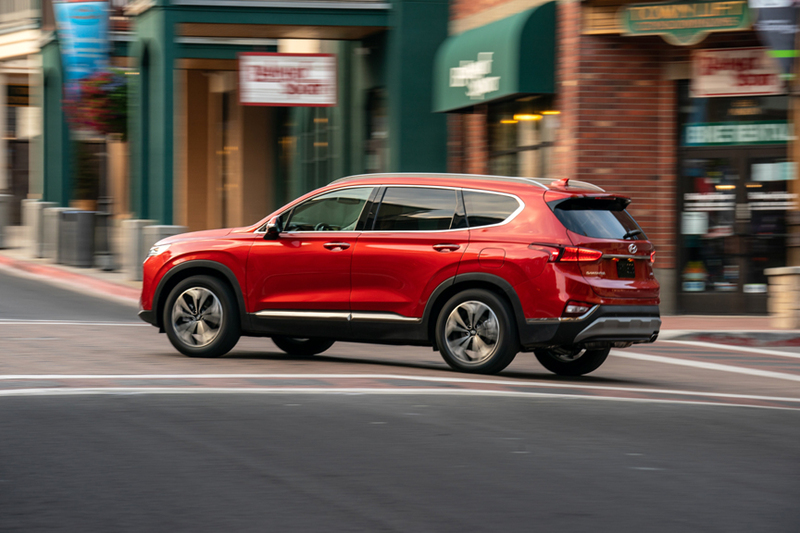 Be forewarned that Hyundai is planning to phase out the 7 passenger XL after the 2019 model year in favor of an all-new, even larger crossover that will seat 8. The 5 passenger Santa Fe we spent a week testing - the Ultimate 2.0T AWD - is the top model of the 7 versions available. This one was loaded with everything Hyundai could possibly offer on its Santa Fe. The window sticker lists no fewer than 37 separate line items, under the headings of Warranty/ Safety Technology/ Powertrain Technology/ Comfort and Convenience. Each of these 37 items are followed by the notation "Included." Included is a concept unfamiliar to builders of German and English vehicles, as well as upmarket Japanese products. It means you don't get nickel and dimed for dozens of extras and packages. If you want one item they force you to pay for 9 you don't want. The only "Un-Included" extra on the Santa Fe Ultimate was its $125 set of floor mats. The "Inland Freight and Handling" charge of $980 bumped the $38,800 base price to an out-the-door figure of $39,905. My wife and I sometimes play a game of "How much do you think this one is?" when neither of us has seen the sticker. In this case she was quick to suggest the new Santa Fe was "at least $45,000." Indeed, the lavish interior would suggest that as a logical price point for this plushy all-wheel-drive SUV. 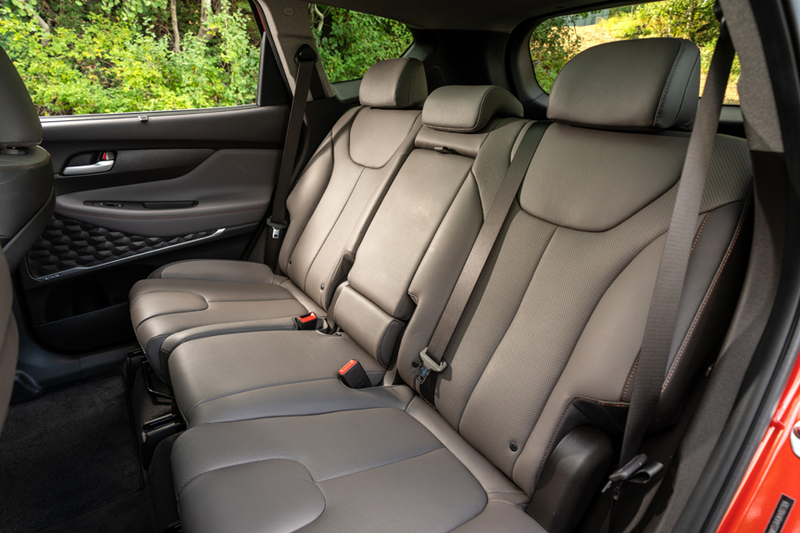 Four of the five passenger seats (2 front, 2 rear) are heated. The steering wheel is heated. The outside rear view mirrors are also heated. You have to love Hyundai for not calling these 7 sources of heat a "Cold Weather Package" and charging you an extra five hundred bucks for the convenience. Same reasoning goes for the "included" Navigation System and its 8 inch display screen, which is Apple CarPlay and Android Auto compatible. The 7 inch instrument cluster allows you to chose digital or analog gauge face readouts. 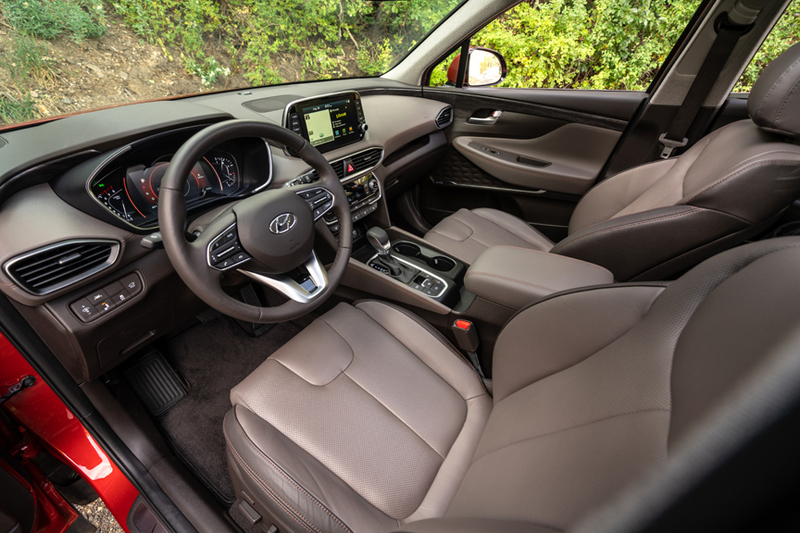 In fact, the first 15 minutes I spent in the cockpit were dedicated to running through a series of available drive/safety/performance options, and customizing the Santa Fe to my preferences. These choices are made by simply revolving through menus with the flick of your thumb on the right spoke of the leather wrapped steering wheel. This proved to be one of the simplest set-up routines available in any new vehicle today. It's a tribute to the intuition of Hyundai's design staff that a complete novice can feel comfortable working through a huge series of options with absolute confidence. However, setting up a five station favorite menu of XM radio choices proved a little more frustrating and illogical than selecting the driving options. 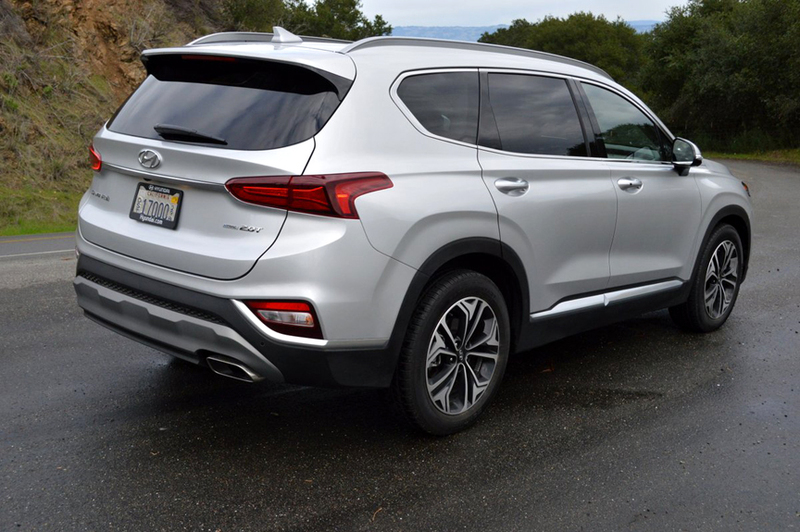 All 5-passenger Santa Fe models use only 4 cylinder engines for motivation. All engines feed their power to a new 8-speed automatic transmission with "Shiftronic" manual override. Base models utilize a 2.4 liter motor good for 185hp and 178lb.-ft. of torque. Ultimate versions couple a 235hp turbocharged engine to that 8-speed gearbox. Because the turbo 4 makes 260lb.-ft. of torque (at just 1,450rpm), this Hyundai is rated at 3,500 of tow capacity. If you need to tow more weight, the XL Santa Fe can be equipped with a 3.3 liter V6 good for 290hp and 252lb.-ft. of torque. That combo offers a tow rating of 5,000lbs. A strong factor in favor of buying the 5-passenger Santa Fe is its comparatively nimble driving experience. It weighs just 4,015lbs. compared to the bulkier XL which scales at 4,210lbs. Also, the Ultimate version of the 2.0T is equipped with a set of 19 inch alloy rims which carry all-season Continental Cross Trek radials with a fat sectional width of 235/55R19. Handling is surprisingly responsive with these low profile, wide tread tires doing their best to stick to the apex of every curve. The Santa Fe features fully independent front and rear suspension and boasts anti-roll bars at each end. These refinements explain why this SUV is so stable on curved roads. 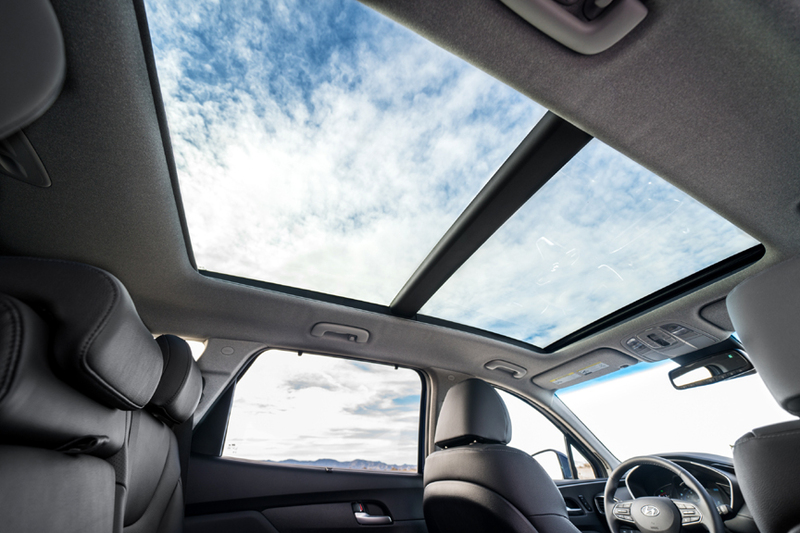 One of the nicest "included" features we enjoyed was the huge "panoramic" sunroof, which sheds ample light on the front and back seats of the Santa Fe. Unless you need the extra slots of a third row to transport your soccer team, the redone 5-seat Santa Fe is the hot ticket this year. It looks better than ever, costs significantly less than you would expect, and covers all the bases and then some with unlimited free inclusions.